Family mediation is a way of helping families to reach agreements about what should happen after separation or divorce. It is an increasingly popular alternative to asking the court to make decisions about family issues. Every day, family mediation helps couples who are in the process of separating or divorcing to decide what to do about the house, the children, the assets, the debts, and can help everyone in the family to establish new working relationships. If you want to know more, it may be worth checking out our article, Mediation is not . . . I have concerns about being in the same room as my former partner. The government and many judges believe that more people should use family mediation, to avoid the expense, delays and conflict often associated with going to court. Family mediation is now an official part of the Family Justice System because most people who want to ask the courts to make a decision about a family issue now have to see an authorised family mediator first, to find out more about family mediation and other alternatives to court. These meetings are called Mediation Information and Assessment Meetings, or MIAMs. If you are not sure whether or not family mediation would be a good option for your family, it is probably a good idea to go to one of these meetings, to talk to a mediator about your personal situation. What issues can family mediation deal with? All FMA members have been trained to mediate the full range of issues associated with divorce and separation, including children, communication, division of capital and other financial concerns. FMA mediators have a particular interest in and commitment to working co-operatively with other specialists – legal, therapy and financial (including pension) experts. Each FMA mediator meets regularly with her or his professional supervisor, working closely with the supervisor to ensure that the FMA’s high standards are maintained. There are FMA mediators throughout England and Wales. You can find your local FMA mediators by using the FMA’s Find a Mediator service. Many FMA mediators offer special services, so it may be worth thinking about what your family particularly needs from a family mediator before making your choice. It is very important to find a qualified mediator, whatever their background. Qualified mediators have successfully completed a recognised training course, and each year they must complete a certain amount of training, satisfy a professional supervisor that they are working to certain standards, and work the required number of mediation hours. Qualified mediators must also have appropriate professional insurance. Are you planning to pay for the mediation yourself, or are you entitled to help with payment because you are on a low income? If you are paying privately you need to check the rates your local mediators charge for mediation session. Some charge an hourly rate, some charge on a sessional, or case basis. Most mediators also charge for the assessment meetings that take place before the mediation begins. The rates that family mediators charge are generally much lower than the rates that family lawyers charge, but it is always very important to be clear from the beginning how much you are going to be charged, and what the mediator charges for. If you have a low income and relatively low capital, you may be entitled to legal aid. As you probably know legal aid is no longer available for most family matters that go to court, but it is still available for family mediation. You should look for a mediator who is specially qualified to offer legal aid mediation. The mediator will help you to work out if you are entitled to legal aid, and if you are, your mediator will then ask the Legal Aid Agency to fund your mediation. If later on you want to turn your mediation proposals into an agreement, your family mediator can sometimes arrange for legal aid to pay for you to get some help from a solicitor as well. Not all FMA members are qualified to offer legal aid mediation. Our website shows who does legal aid work and who does not; if you think you may be entitled to legal aid, but aren’t sure, it is usually best to find a mediator who is qualified to offer legal aid. All FMA members will do their best to suggest a local mediator who can help you. Do you think it may help for your children to be consulted within the mediation? Many FMA members are specially qualified to involve children directly in family mediations. There are many things to think about when deciding whether or not it is appropriate for an individual child to be involved directly, which will have to be talked through by both parents, and with the mediator, but involving children can be very useful if the right preparation is done. The government has said that it believes all children above the age of 10 should have an opportunity to see a mediator if their parents are using mediation to make decisions about child arrangements. If you are interested in involving a child in the mediation you can look for a mediator who is trained to work directly with children. However, the mediator who works with the parents doesn’t have to be the same mediator who meets with the child, so you could opt for a mediator who isn’t qualified to see children directly, and ask the mediator you choose to find you a mediator who is qualified to meet children. 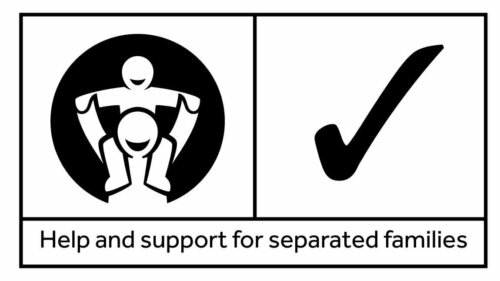 FMA mediators all understand how child-inclusive mediation works, even if they do not do this work themselves, and will be able to talk through the options with you. FMA mediators will be very happy to talk to you about the different kinds of family mediation that are available, and will be able to advise you about the one that is best suited to you. After the assessment meetings have taken place, the normal process in this country involves two adult clients meeting with a qualified mediator together in one room, and all three people talking through the issues and the possible solutions together. This process is described in more detail in steps 4-6, but in outline the normal process involves from 1 to 6 sessions, depending on the number of issues that need to be discussed and how complex or difficult the issues are; each session usually lasts between one and a half and two hours. With the client’s agreement the mediator may invite other people into the process if that seems helpful, for example a pensions expert or a family therapist; other professionals invited to take part might attend the mediation sessions, or they might set up separate sessions of their own. One of the most common alternatives to sole mediation involves two adult clients meeting with two qualified mediators together in one room, and all four people talking through the issues and the possible solutions together. The FMA was founded as a co-mediation organisation, FMA members are all trained to co-mediate, and most of our members are very happy to work as co-mediators. Some mediators use co-mediation only occasionally, when they think it will be especially useful to have one mediator per client. Other mediators use co-mediation in almost every case, because they prefer working in this way. It is very common for co-mediators to be a man and a woman, and/or for them to be from different backgrounds (for example one from a legal background and one from a therapy/counselling background). Another way of working is to use two rooms. The two adult clients each stay in their own separate room, and the mediator or mediators ‘shuttle’ between them. There is no face to face communication between the clients, so this kind of mediation doesn’t help to develop better communication in the way that other forms of mediation can, but it can be a good way to help clients negotiate safely. Shuttle mediation sessions usually take longer than other mediation sessions. Sometimes lawyers are involved in this form of mediation, each person bringing his or her own lawyer and consulting with them about the options available as the mediation progresses. Sessions involving lawyers, sometimes known as caucus mediations, are more expensive, and tend to take quite a long time (half a day or even more). FMA members often participate in shuttle mediations, and are comfortable inviting lawyers, and indeed other professionals, into the process. This is an approach that can be combined with any of the other methods. In it, a child who wants to be involved in the process talks with a specially qualified child consultant mediator. The parents agree in advance that this meeting is confidential between the child and the mediator, and unless any child protection issues arise, the mediator will only tell the parents what the child has agreed should be passed on. If the mediator working with the parents is a child consultant mediator, the child can meet with the same mediator who is working with the parents, but quite often it is a different mediator. Consultations usually last about 45 minutes with each child and children are usually aged 10 or above, but in some circumstances younger children may be seen. Many FMA mediators are qualified to do this specialist work. Many mediators use a combination of the different kinds of mediation mentioned above. Family mediators are trained to tailor the process to the specific needs of your family, so don’t be surprised if the process your mediator uses looks a little different to those you have read about. Family mediation is developing all the time, and sometimes borrows different styles from other forms of mediation, including mediation techniques used in non-family property disputes and some variations used in other countries. Provided the core principles are respected, your family mediator is free to work in a creative way to make sure that the family mediation process chosen for you will suit your personal circumstances. It’s important that you feel comfortable with the process. Your mediator will explain how it works before you begin, but here is our overview of how the process works. Every mediation will begin with an assessment meeting. Many people have separate assessment meetings some time before the first joint session. Some people prefer to come together to the assessment meeting, with a joint session following straight afterwards if their case is suitable for mediation. FMA members usually offer both types of assessment, but whichever type is chosen there always has to be some opportunity for the mediator to talk separately to each person. This is so that the mediator can ask some confidential questions designed to find out whether there are any special issues that need to be taken into consideration. Often the same mediator will be involved throughout, but sometimes one mediator meets with each person at the assessment stage, and then a different mediator conducts the actual mediation. At the very beginning of the actual mediation, the mediator will ask you both to sign an agreement to mediate, after checking with both of you that you understand what it says and that you both know how mediation works. The agreement to mediate is a standard document, used by all qualified family mediators, and is something that is required by the Family Mediation Council, which regulates all family mediators. The mediation cannot go ahead unless the agreement to mediate has been signed. During the mediation your mediator will give you useful information about how to deal with financial issues, how to deal with children issues, relevant legal principles, the court process, court orders, and how to contact other agencies and specialists who may be able to help. The mediator will ask you important questions about what ideas you have about the future, and about what is worrying you about the present. They may even talk a little about what has gone wrong in the past, although the problems of the past are not the main focus of mediation. The mediator will also set the rules he or she expects everyone to follow. These will include speaking and listening to each other with respect, and working with the mediator to make sure that conflict and any strong emotions that emerge during the mediation don’t overwhelm the process. Most family mediators work in a relatively informal setting, and all qualified family mediators provide clients with a relaxed and secure environment. During the session, the mediator will record key pieces of information or ideas or particular options in a way that allows both of you to see what has been written and to comment on it. Usually the mediator will use a flip-chart to do this, but many also use more modern technology. You will be encouraged to ask questions and discuss what is being written down. If you don’t understand something that is being said by anyone in the room, or don’t understand something that has been written on the flip-chart by the mediator, it is very important to say so. It is the mediator’s job to help. Your mediator will be keeping an eye on how you are feeling, but if you start to feel uncomfortable or worried about anything, you should let the mediator know. Decide the priority of the issues. Some issues are more pressing than others and need to be resolved first, e.g., short-term financial arrangements, holidays, contact. Clarify the issues: sometimes it is not certain what is really in dispute and clarifying the issues avoids misunderstandings. At the end of the mediation process your mediator will explain to you how to obtain legal advice about any proposals the two of you have produced together and how you may convert them into a legally binding agreement and/or a court order. Proposals relating to children often do not need to be turned into a court order, but proposals relating to finances almost always should be. If you have not been able to find any mutually acceptable proposals, your mediator will explain to you what your options are at this stage, including negotiation through other means, arbitration and court proceedings. Although the mediator will never instruct you to do something, they may suggest that you take further advice, for example that you consult with a tax or pensions specialist, or with a family lawyer, before making any decisions.